WARSAW — With the 14th anniversary of 9/11 quickly approaching, many in Kosciusko County are feeling the weight and solemnity of the event. However, few are more dedicated to the remembrance of the disaster than co-chairman of the 9/11 Memorial Remembrance Committee Mike Cox. Cox was a veteran and law enforcement officer for 28 years. “We started planning just months after 9/11,” he explained. “The first year, we had a parade that ended at Boggs Park, and we pretty much knew we wanted to make it an annual event.” Since then, there has been some sort of memorial event every year. His vision through those first years was clear: he wanted to create a permanent monument to 9/11. With the help of the Parks and Recreation Department, Patten Monuments and many generous donations, his vision became a reality. In 2009, the 9/11 memorial was set in stone in the middle of Central Park. This side of the 9/11 memorial faces New York City. 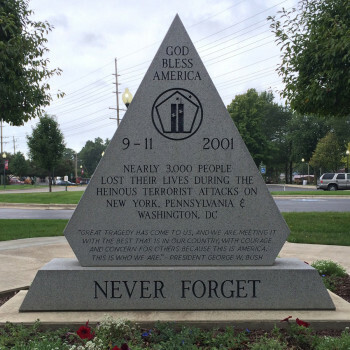 With one side facing New York, and the other naming Kosciusko emergency responders who have lost their lives in service, the monument stands strong as a symbol of remembrance for the lives lost in service of our country, and of the tragedy that occurred 14 years ago. “I just don’t want them to be forgotten,” Cox said of the memorial. This year, the 9/11 Memorial Remembrance Committee is planning an event in Central Park. The memorial event, which Cox said usually has a “demeanor of patriotism,” will include a live band, bleachers, police and fire vehicles and even speakers. Brad Kellar, a Warsaw police officer, is scheduled to sing as well. 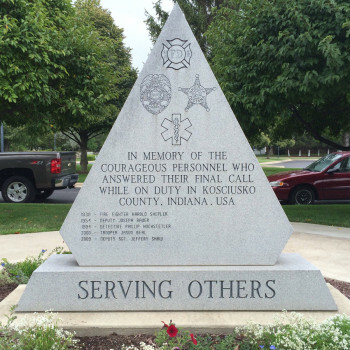 This side of the 9/11 memorial commemorates Kosciusko County EMS officials who have lost their lives in service. The event is scheduled for 6:30 p.m. Friday, Sept. 11, in Central Park. This 14th annual event will usher in next year’s memorial, which is set to be another parade.